AURA AUDIO FINLANDA DIFFERENT SOUND THEORY Jürgen Franzen, FaitalPRO: A talk with Mika Isotalo (picture above on the right) about rental and installation. 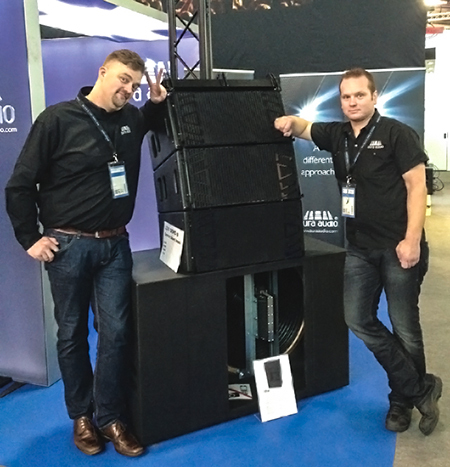 Aura Audio Oy is an independent sound reinforcement systems manufacturer situated on the Finnish south west coast. Innovation and continuous product development have always characterized their nature, leading to several EPO and US patents being awarded. Jürgen Franzen: "Give us a 'once over' on your company, tell us who you are, what range of services you offer, what type of customers you attend to." Mika Isotalo: "My company's name is Aura Audio and it was originally established in Finland in the late 90´s as a studio and small live sound service company. At the beginning of the new millennium our business focus shifted to mainly loudspeaker manufacturing, which we had already touched upon during the 90's. Our first customers were mostly small rental companies and little by little we started getting more installation jobs." J.F. : "has your company become exactly as you wanted it? Are you pointing in some other direction now?" M.I. : "Yes, to me Aura represents the kind of out-of-the-box thinking I´ve always looked for in this industry. We are now totally self-sufficient in both R&D and cabinet manufacturing & assembly. This enables us to be very dynamic in terms of lead times for custom projects and quality control. Working closely with our customers and suppliers during the past decade has resulted in a wide range of products with different acoustic approaches to common solutions." J.F. : "How would you qualify your customer base / target market?" M.I. : "Today we are able to respond to three main types of applications which contribute equally to our market share: rentals, small size installations, larger installations like big dance floors and live clubs." J.F. : "Can you share one or two anecdotes on a particular installation using FaitalPRO components". M.I. : "I can´t really pick one there are so many nice ones!" J.F. : "How is the business atmosphere in your territory, client base, and what products are really threading forward?" M.I. : "We have two particularly nice and unique subwoofer designs and multi nationally a patented mid-range driver technology on which our main touring and large scale installation loudspeaker models are based. Our best sellers are A-Series, C-Series, XD-Series, F-Series and I-Series. We also manufacture the D-Series loudspeakers management system with dedicated class-D power amplifiers." J.F. : "You are definitely using several FaitalPRO loudspeaker models in your designs, can you tell us why you made the switch to FaitalPRO?" M.I. : "For many of our subwoofers we use FaitalPRO drivers for their performance and reliability. The newer small drivers and compression drivers are also very nice!" J.F. : "Why should a customer choose FaitalPRO products instead of others?" M.I. : "I would say FaitalPRO has a good selection of drivers for different solutions; and besides reliability they offer a very good price to quality ratio." J.F. : "Will you continue to experiment with additional models and products from FaitalPRO?" M.I. : "Of course, all the time ;-)"
J.F. : "What is the most successful product you buy from FaitalPRO?" M.I. : "Probably the whole Five Hundred Series"
J.F. : "Can you share just one personal view on FaitalPRO's philosophy and market approach?" M.I. : "We do appreciate most the friendly customer service and the open dialogue with R&D which is always critical in our business"
J.F. : "Any idea for future plans?" M.I. : "We will have a lots of cool co-operations and projects in the future!"